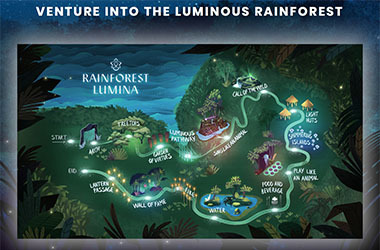 An immersive multi-sensory journey into the lush rainforest at Singapore Zoo. Ever wondered what happens in the rainforest at night? Pull the vines aside and discover a lush and luminous universe. Meet the Creature Crew, a quirky group of unlikely heroes who invites you to join their whimsical adventure. When the day ends for our real animals, the Creature Crew takes on the role of protecting the rainforest. The Creature Crew believes that every species has the power to give back to the rainforest: nature, animals, and humans too. Their motto –We Are One – means that everyone has a special role to play. Play, sing, and discover their enchanted world. For wherever the Creature Crew roams, the rainforest blooms with wonder. 7.30 p.m. – 12.00 a.m.